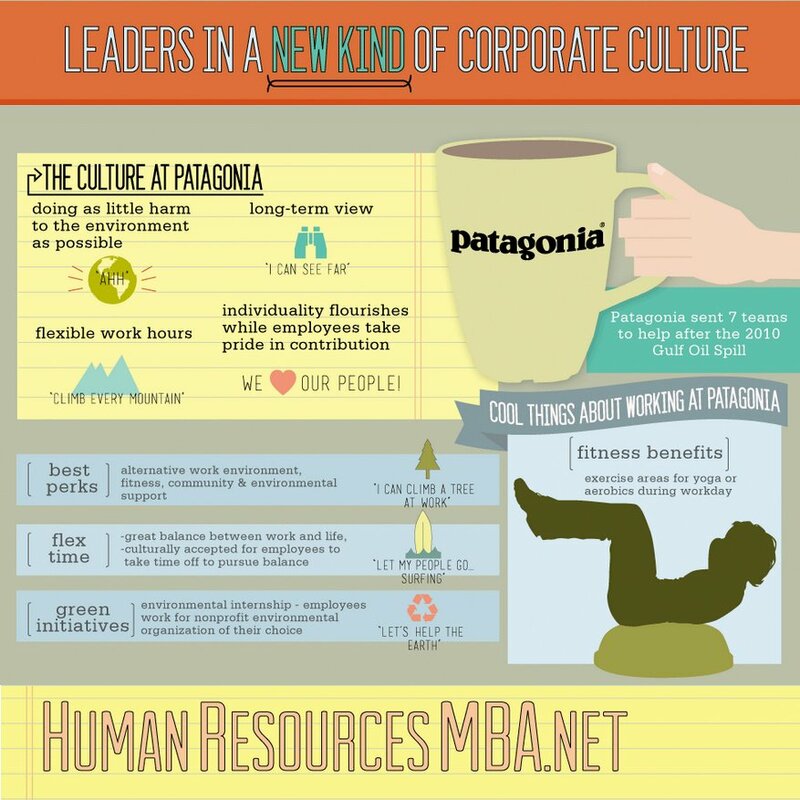 HomeBlogCulture and Business PerformanceCorporate Culture & Money: Strange Bedfellows? Not at Patagonia! Sure Pixar, Patagonia, and Google all have cool corporate cultures, but they also know that corporate culture matters to bottom line performance. Each of these companies approaches culture differently (like each family has a unique personality). Yet they all realize that nurturing your people creates people who are for your business. It’s a simple equation that is unfortunately over-thought, over-analyzed, and over-complicated by too many organizations. Today, we shine the spotlight on Patagonia, an organization long-admired for their commitment to social responsibility and a global brand, whose culture is an expression of the founder’s unique personality. Chouinard was known for his “MBA” approach—”management by absence.” He often travels for months, fishing or climbing. When he comes to the office, his daily uniform is jeans and a Patagonia button-down shirt. He has no computer at his desk, but rather an Etch A Sketch where co-workers can leave friendly messages. When he greets employees in the halls, he will ask about their recent climbing feats, or invite them to surf at his house the next time the waves are rolling. Aligning people to clear direction is a key culture success factor: Why? Research shows that organizations who hear frequently and regularly from their CEO and leadership team) about direction (both where we are headed and how we’re doing) grow up to 4 times faster in market share and profitability. That mission is expressed well in Chouinard’s book, “The Responsible Company,” providing detailed checklists for making money without inflicting undue societal harm. For a maker of fashion fleece-ware (which might be about as exciting as selling soap!) Patagonia is gaining the attention of mega-corporations, who increasingly view stewardship of their communities and customers as essential as stewardship of the bottom line. Chouinard has even partnered with Walmart to advise them on reducing packaging and water use in its supply chains. Levi Strauss—with more than 10 times the annual revenue of Patagonia has worked for 18 months to redesign their processes resulting in a savings of 45 million gallons of water, as well as the energy it would have cost to heat that water. It’s not just about altruistic business practices. “The business savings costs are real,” says Michael Kobori, Levi’s V.P. of social and environmental sustainability. Companies who stand for values beyond just making money, succeed in attracting more loyal customers and employees. No research needed on this one; almost every human being wants to be part of something good and meaningful, at the core. Having a mission for social responsibility today is good brand management in an age when the internet exposes everything. Customers are increasingly aware of organizations’ social ethics, as are employees. To do this well requires that the internal culture reflect the same brand principles you are touting to your customers. 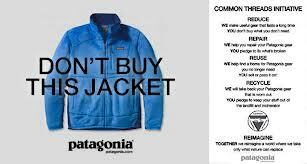 In November 2011 on Black Friday—when most retailers are opening at 4 AM to maximize revenues leading into the Christmas season—Patagonia bought a full-page ad in the New York Times with the headline “Don’t Buy This Jacket.” The fleece jacket ad copy was followed in minute detail: How much water was wasted and carbon emitted in the course of its construction. In fact, Chouinard says the ad boosted Patagonia sales; he claims it was NOT through increased purchases from existing customers, but mostly through customers who would have bought cheaper products from competitors. Patagonia somehow created a rare perception of quality and do-gooder aura that certain people believe is worth a higher price. • Flex-time policies famously allow workers to come and go based on when waves are high at the nearby surf point … or whatever else they have to do – as long as deadlines are met. • At the prodding of Chouinard’s wife, Malinda, Patagonia was one of the first companies in California to provide on-site, subsidized day care. Companies who create a work-life balance get more from employees: Most skeptics would question whether such practices could work at a giant, publicly listed corporation (think Google!) or it’s only possible if you have a premium pricing model. (if you believe that, read our recent blog about Costco and their founder’s philosophy on taking care of their people). But Chouinard, like other savvy leaders today knows that a more fulfilling, happier workplace attracts and retains better workers, who in turn design superior products and think of smarter strategies.